How is it that the Charter of the Forest has been nearly forgotten? Historian Peter Linebaugh explains in his wonderful book The Magna Carta Manifesto that the two charters of liberty were often publicly linked. Indeed, the very term Magna Carta was used to distinguish the Great Charter of 1215 with the "lesser" one issued two years later, the Charter of the Forest. It wasn’t until 1297 that King Edward I directed that the two be treated as the single law of the land. In 1369, King Edward III issued a law that incorporated the two into a single statute, with the Charter of the Forest becoming chapter 7 of the Magna Carta. Over the centuries, the Charter of the Forest, seen as a minor subset of the Great Charter, receded from public memory. Read more about The Charter of the Forest, Now 800 Years Old! In the 1990s, many communities in central Oregon were torn asunder by the “War of the Woods.” Environmentalists had brought lawsuits against the U.S. Forest Service for violating its own governing statutes. For decades, timber companies had been allowed to clear-cut public forests, re-seed with tree monocultures, and build ecologically harmful roads on mountain landscapes. Environmentalists won their lawsuit in 1991 when a federal judge issued an injunction that in effect shut down timber operations in the Pacific Northwest of the US. While the endangered northern spotted owl was the focus of much of the debate, the health of the entire ecosystem was at risk, including the Pacific salmon, which swim upstream to spawn. There is often no substitute for litigation and government mandates, and the 1991 litigation was clearly needed. But what is really interesting is the aftermath: Rather than just designating the forest as a wilderness preserve off-limits to everyone, the Forest Service instigated a remarkable experiment in collaborative governance. Instead of relying on the standard regime of bureaucratic process driven by congressional politics, industry lobbying and divisive public posturing, the various stakeholders in the region formed a “watershed council” to manage the Siuslaw National Forest. 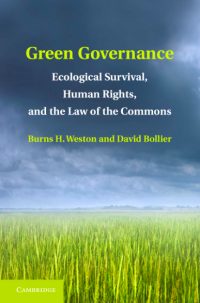 Twenty years later, this process of open commoning has produced a significant restoration of the forest ecosystems, implicitly indicting the previous forest management regime driven by politics and the formal legal system. These were complex and ancient ecosystems, particularly on the west side of the Cascades, where the moisture from Pacific storms gave rise to rich and diverse temperate rainforests. Hundreds of species of animals and plants depended on this habitat to survive. For 40 years, these forests were logged with the same industrial methods practiced on private land. Vast swaths were clearcut, then densely replanted with monocultures of the fastest growing trees. When they reached sufficient size, they were scheduled to be clearcut and replanted again, in an ongoing cycle considered sustainable by those who employed it. The aftermath of the 1991 litigation could have been simmering hostility and litigation, which would likely flare up again. It was based on the old, familiar narrative of “jobs vs. the environment,” a debate that government was supposed to mediate and resolve. In Oregon, however, it was decided to develop a “Northwest Forest Plan” that inaugurated a new space and shared narrative. The Siuslaw Watershed Council invited anyone with an interest in the forest to attend its open, roundtable meetings, to discuss how to manage the forest and resolve or mitigate the competing interests of timber companies, environmentalists, recreational fishers, local communities, hikers, and others. Outcomes were based on consensus agreement. The following is an interview with Soma Kishore Parthasarathy from the website of the Association for Women’s Rights in Development (AWID) on June 6. The interviewer was Ana Abelenda, and the piece is called “Reclaiming the Commons for Gender and Economic Justice: Struggles and Movements in India.” It is republished here with permission. AWID spoke to Indian independent researcher and scholar Soma Kishore Parthasarathy, who has been studying and negotiating the concept of the ‘commons’ from a gender perspective and how women in rural India are contesting this reality by proposing a shared management of common resources. 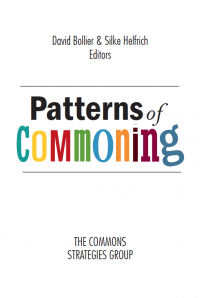 AWID: How would you define the “commons"? 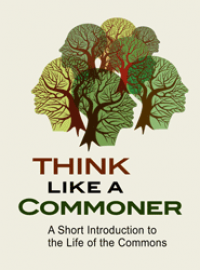 Soma Kishore Parthasarathy (SKP): There are varied conceptualizations about the commons. Conventionally, it is understood simply, as natural resources that lie outside the private domain and are intended for use by those who depend on its use. But, it is not just natural resources, it is also knowledge resources, heritage, culture, virtual spaces, and even climate plays a role. 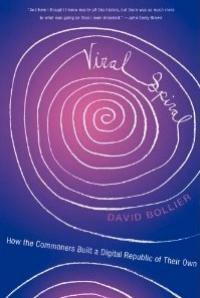 The concept of the commons pre-dates the individual property regime and provided the basis for organization of society. Definitions given by government entities today limit its scope to land and material resources. Attempts to release commons from the shared domain into the market, pose a serious threat to the commons as we know them, and to the way of life associated with the sharing principle embedded in their access and use. It is about the cultural practice of sharing livelihood spaces and resources as nature’s gift, for the common good, and for the sustainability of the common. 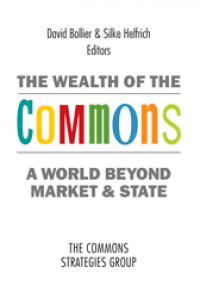 But today commons are under increasing threat as nations and market forces are colonizing the commons. AWID: Can you explain what you mean by colonization of the commons? How does it affect women in particular? SKP:Colonizing the commons implies a predatory usurpation of the commons by parties in positions of authority and power, who impose their own set of rules and terms for the access, use, and regulation of the commons to serve their own needs, with little concern for rules and organizational principles that existed earlier and with little respect for the needs and rights of those who have been dependent on the commons for centuries, ignoring the rights of traditional small users and gender and equity issues. We have so internalized the logic of neoliberal economics and modernity, even those of us who would like to think otherwise, that we don’t really appreciate how deeply our minds have been colonized. It is easy to see homo economicus as silly. Certainly we are not selfish, utility-maximizing rationalists, not us! And yet, the proper role of our emotions and affect in imagining a new order remains a murky topic. Credit: netlancer2006, on Flickr, under a CC BY license. How do people become “environmental subjects” – that is, people who are willing to apply their subjective human talents, imagination and commitments and become stewards of some element of nature? Singh wanted to investigate why villagers were willing to regenerate degraded state-owned forests through community-based forest conservation efforts. She found that “affective labor” is critical in managing a forest. The term comes from Antonio Negri and Michael Hardt, who use it to describe the role that reciprocity, empathy and affect play in shaping human behavior and action. 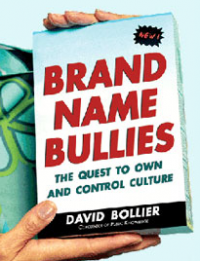 Indeed, other people’s affect influences what kind of “self” we construct for ourselves. This whole topic is important because standard economics has its own crudely reductionist idea of who human beings are. We are “rational, self-interested” economic actors, of course, and most public policy is based on this (erroneous, limited) notion. Most economists frankly have no interest in exploring how people come to formulate their “self-interest.” They simply take those interests as given. But what if participating in commons produced a very different sort of human perception and subjectivity, and indeed, produced human beings as self-aware subjects/agents? What if this process could be shown to be essential in integrating human culture with a specific ecological landscape? An important shift is underway in academia and it seems to be building momentum. It is a spreading inter-disciplinary interest in empathy, cooperation, and group-level behavior that seems to be converging in networks both within and outside of university structures....Cooperation is now a core issue of our times, and because of the ferocious energy of many in the social sciences, it is re-emerging into the spotlight of public attention. Theorists and researchers of cooperation and collective action share the values and passions of practitioners, but, as Marx put it so eloquently, the point is to change the world not just to understand it. And for this endeavor, researchers and theorists can inform and even transform how we do collective action in real life, and we can be a cornucopia of experience for more understanding of the questions they are puzzling over. This is the third of a three-part installment of a report on the future of the commons, which is based on conversations at a retreat held at Crottorf Castle in Germany, in June 2009.